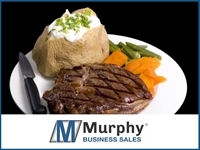 Newly remodeled Steak Restaurant & Bar + Real Estate for Sale on major highway. 6000 sq. ft., 160 seats, 4 COP, 35 employees, 12 yr. business, 70 parking spots + overflow, 1 acre, 2 managers, owner only works 20 hrs./wk. Closed for 3 months in 1st Q. of 2018 for $400K in renovations. Building upgrades now driving $30K more sales per month than in 2017. Clean books, clean new facility. Could add breakfast or increase hours open. R/E appraised @ 1.1M. Business asking 2X adjusted net. 1.1 + 1.1 = 2.2 price. 1 acres. 6000 sq. feet. Off of major highway and next to a hotel. The area population continues to grow. New owner may do well to expand daily hours or even add a breakfast in this spot. Aging Mom -- Moving family back to Greece for a couple years. Lender pre-screened with $330,000 down.